This is a concept that has occupied me for years, resulting in several pieces already. 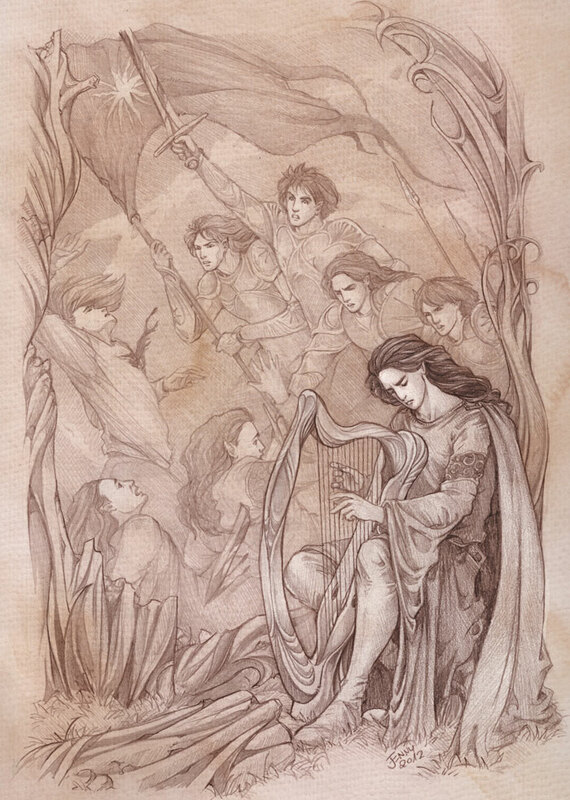 It’s symbolic rather than illustrative of any given passage in the text – Maglor, a remnant of the Elves in Middle-earth but excluded from his people, caught in a world of his own where music no longer brings consolation, surrounded by the ruins of the former greatness of the Noldor, whose downfall he had a part in. I’ve never really done much with the “ruins” part of the scenario; half-hearted attempts at best, probably because I really struggle with architecture of any kind. Now, though, I’ve decided to give it another go. 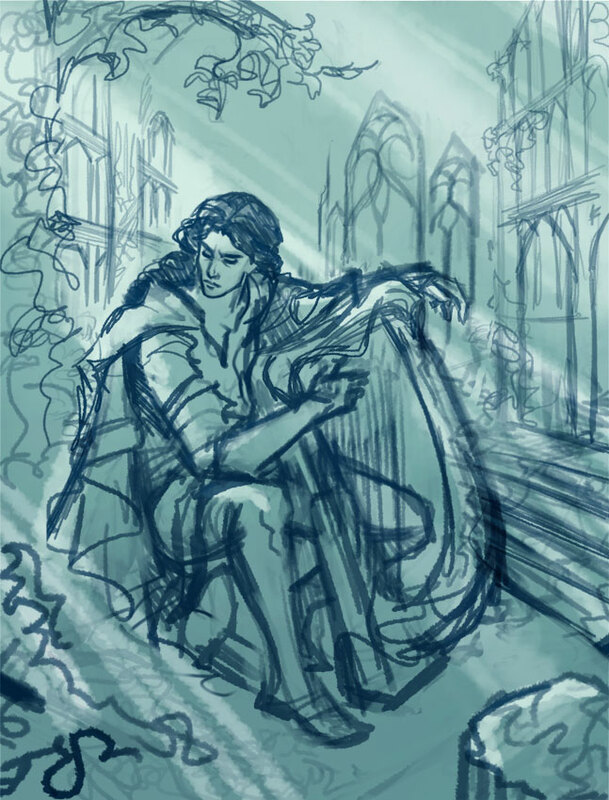 This is a more refined version of the first sketch. 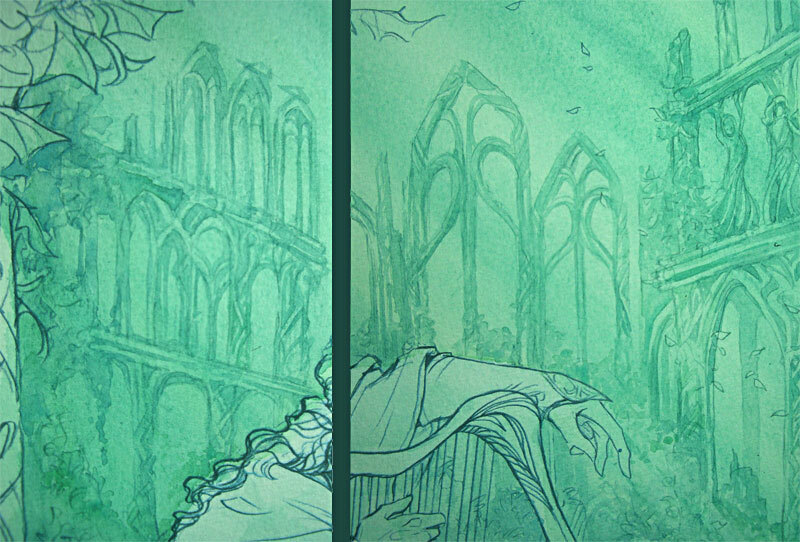 When I print the lineart, I tint the ruins in the background more greenish and very light, so that it will mostly disappear in the finished painting, and reduce the ruins to faint structures that could just as well be from a dream. 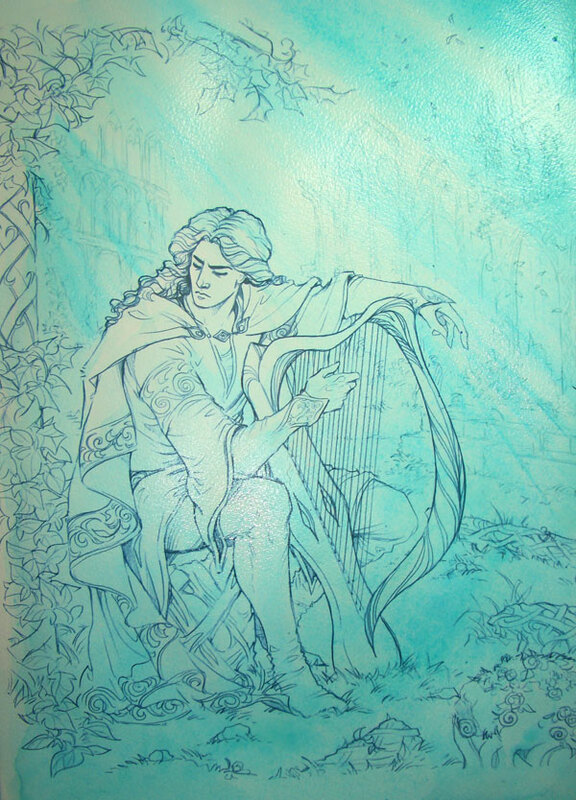 This picture is a great excuse to make excessive use of my new Cobalt Turquoise from Schmincke. 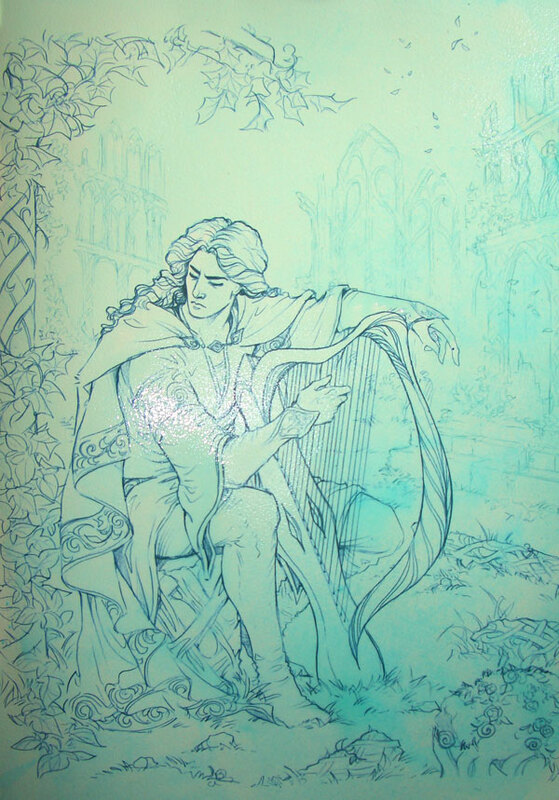 For the first background wash, I mix it with Chrome Oxide Green and a touch of Ultramarine and Cadmium Yellow, and apply it very thinly with a soft brush, lighter at the top and darker at the bottom. I then re-wet everything, and paint darker streaks, that will look like sunlight filtering through tress – or through water. I want the whole lighting here very ambiguous. 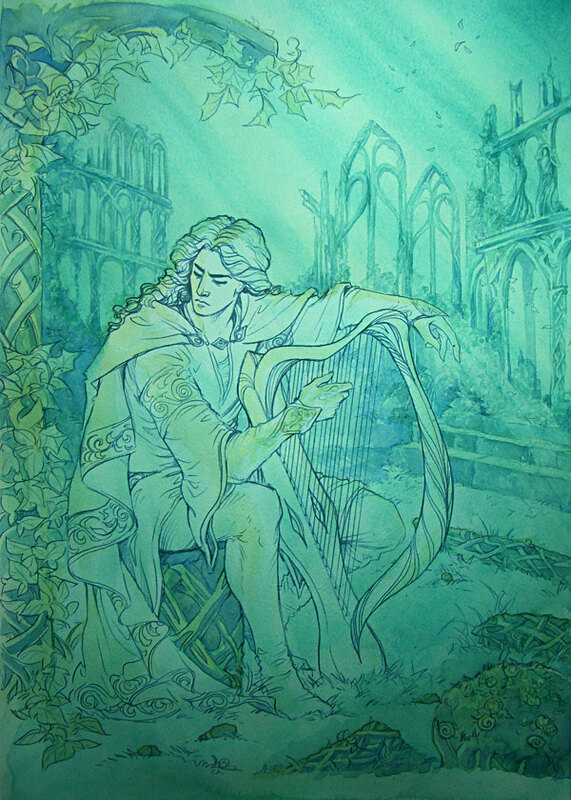 After this has dried, I use the same colours – more green here, more blue there – very thinly to paint the detail in the ruins. In all the following, excuse the turquoise colour mash, please. Next, I add some Ochre to everything in the foreground – first the structures, to suggest sandstone or a similar stone. 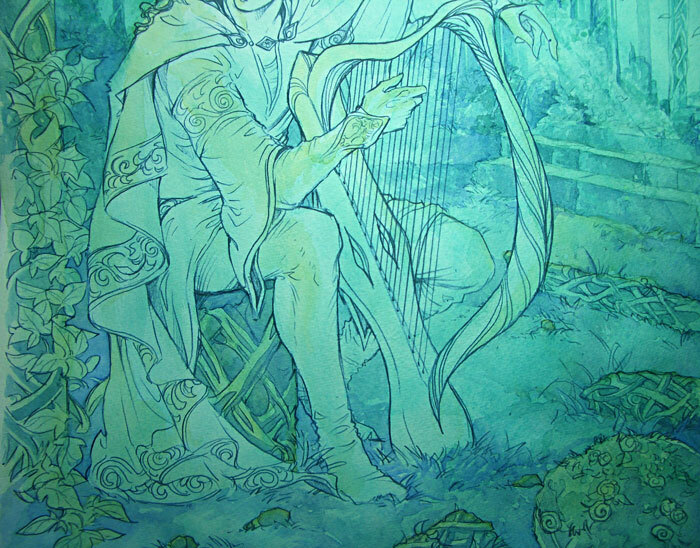 It gets a greenish-blue layer for shadows, to make it stand out less. I then decide Ochre will make a great foundation for the figure too. This looks very yellow now, but will mostly vanish under the greens and blues of Maglor’s clothing later, only serve as a “grounding” in the light situation around him. 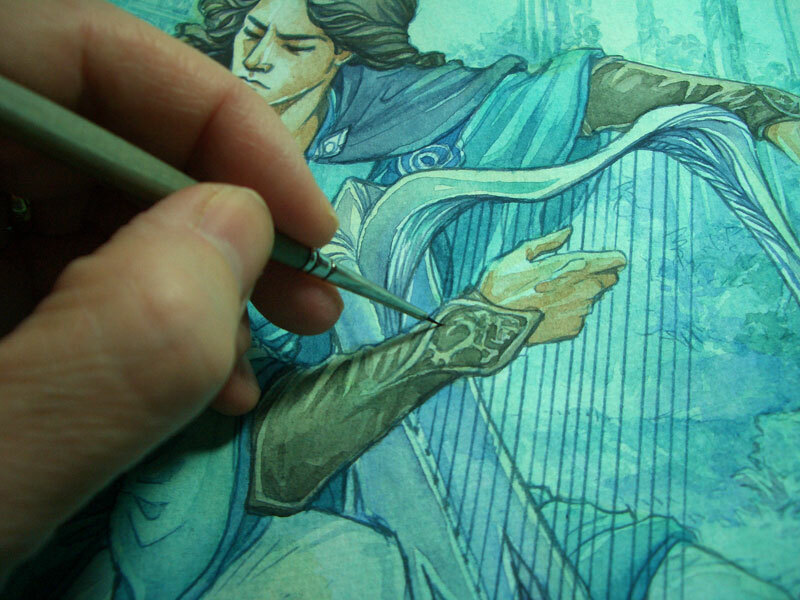 Some detailing in the ground – mainly with Ultramarine and duller Indigo, but with the brush dipped into Chromoxide Green, Cobalt Turquoise, and Ochre here and there for colour variation. 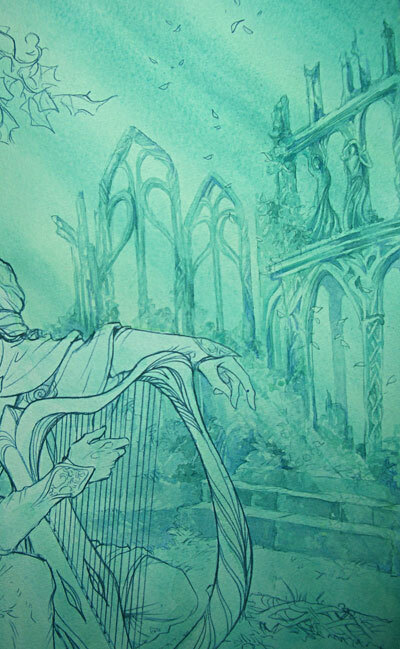 Detailing on the leaves, again with the whole range of greens and blues used above. The skin is done with Burnt Sienna, as usual, but thinned down beyond recognition with my dirty water, which is now a nice green-blue concoction, rather thick too, as it’s dried overnight. Comes in extremely useful for making any colour fit the mood of my painting. 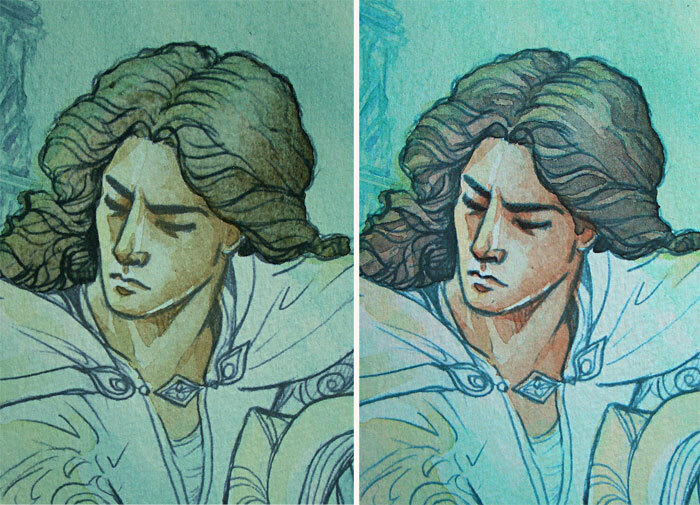 I use the same principle with the hair tone, which is Sepia with a lot of dirty green water. The shadows are done with a touch of Indigo, too. 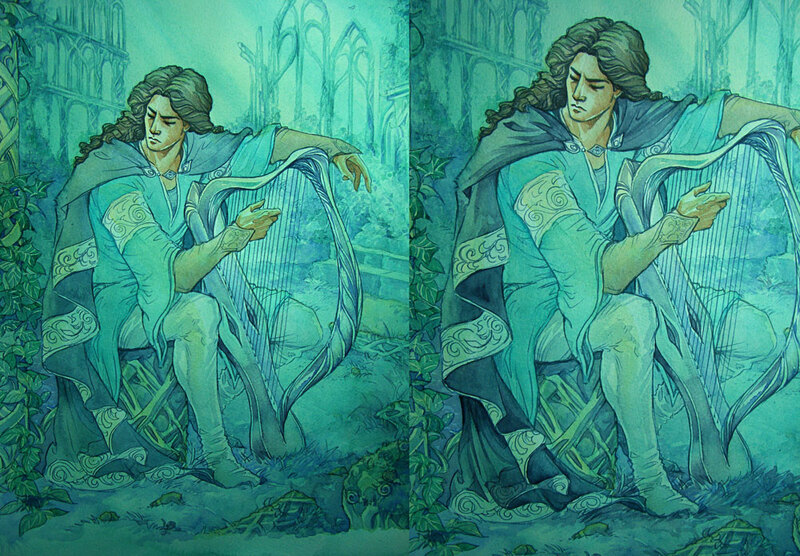 On the image on the right below, I’ve re-drawn the eyes and brows slightly with a Sepia marker, as the lineart was starting to dull under the paint. Below right: First layer of rendering. I build the shadows up slowly, mostly with Indigo, to avoid getting too dark too soon, and adding another layer here and there to add depth. After darkening and shading, and detailing, we arrive at this. 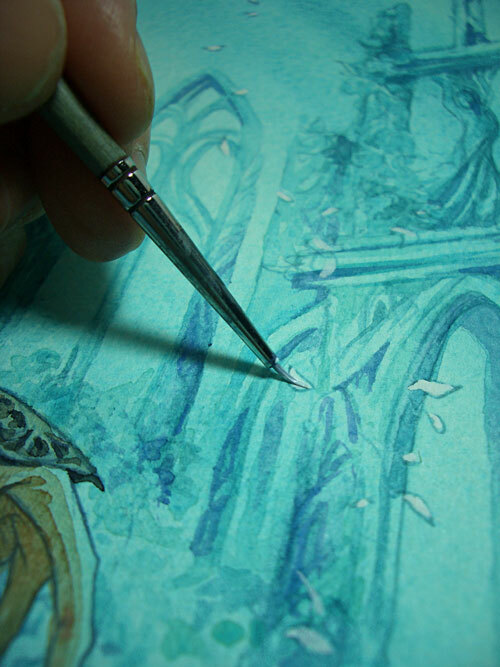 Final touches include painting the falling petals with white gouache. But… is Maglor still alive or not? 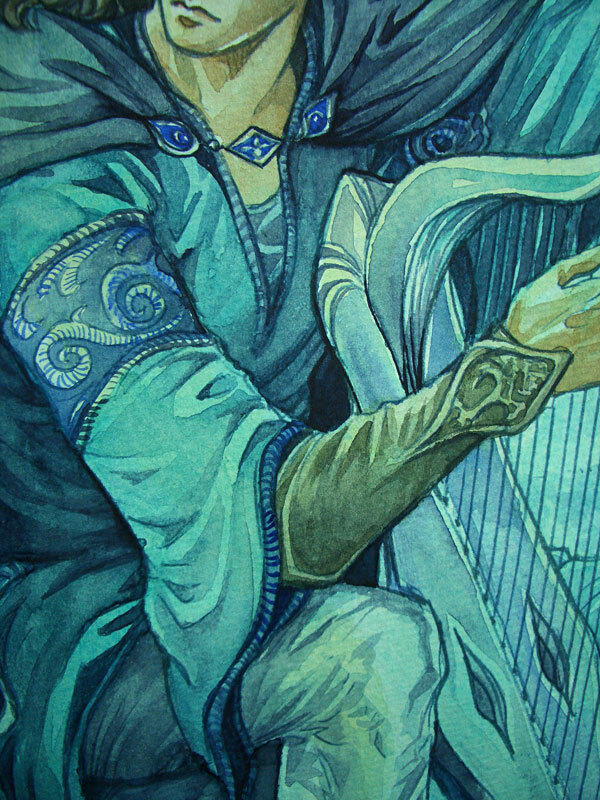 As I’ve written on facebook, it’s stunning :-) I love especially his expression, so involved and otherworldy… And, as someone has written on facebook, his legs are really something XD but, however, I love the overall blue tones you’ve used in the sketch, it gives the image some sort of undersea quality that works magic with an elf that is no longer of this world, and yet he is, in some ways… It’s really an image of things long past. Exactly! I hope I can keep this intact in the colours. I can’t wait to see how this one develops. There’s something so haunting about it…! I love the lighting in this, the way it comes through in rays, like the sun’s gone behind a cloud. 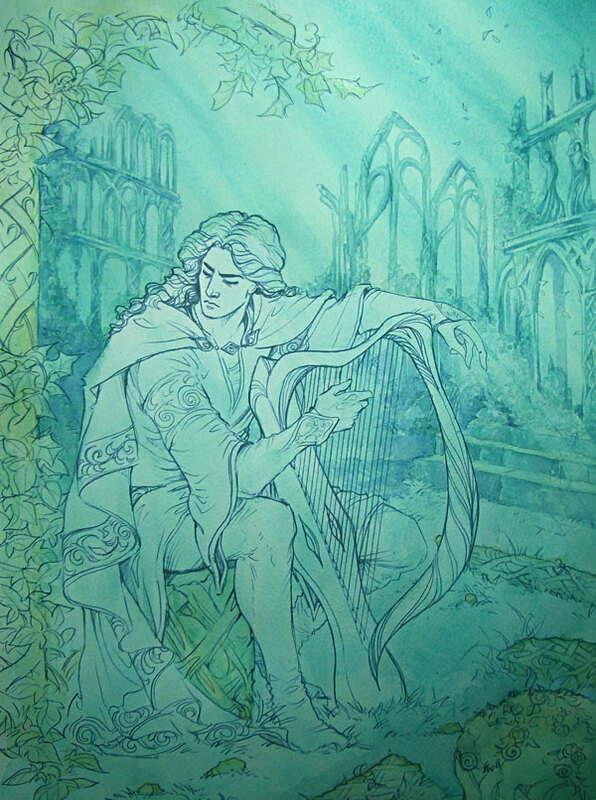 Also, the way he’s turned away from the harp is interesting, as if he can’t even look at it anymore. 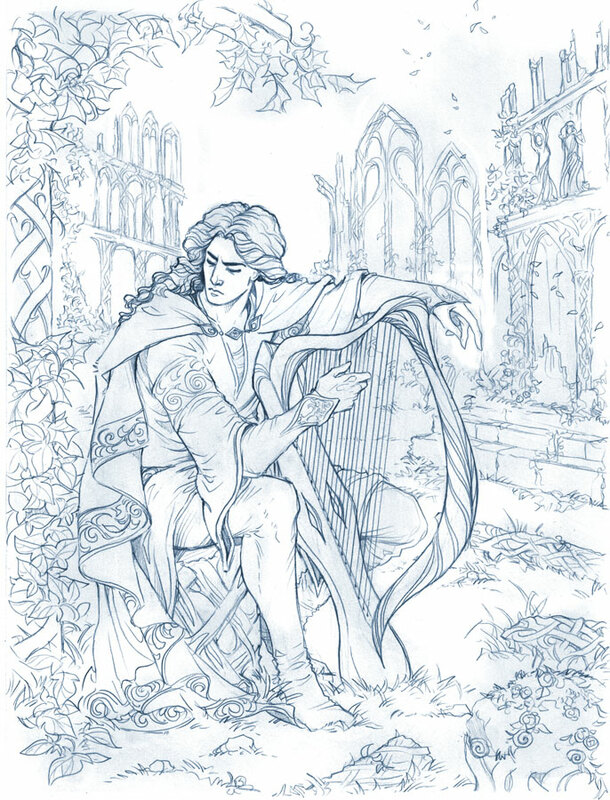 The “living or dead” question: wouldn’t he have been killed when the rest of Beleriand was destroyed after the War of Wrath? Oh, ok, that makes a lot of sense! I feel a bit silly writing that now. Yesterday, I decided, it would probably be my last post on Facebook, since no one is giving a damn anymore. At least in the way I posted before. I guess more than 1000 different youtube music videos over 2 years. 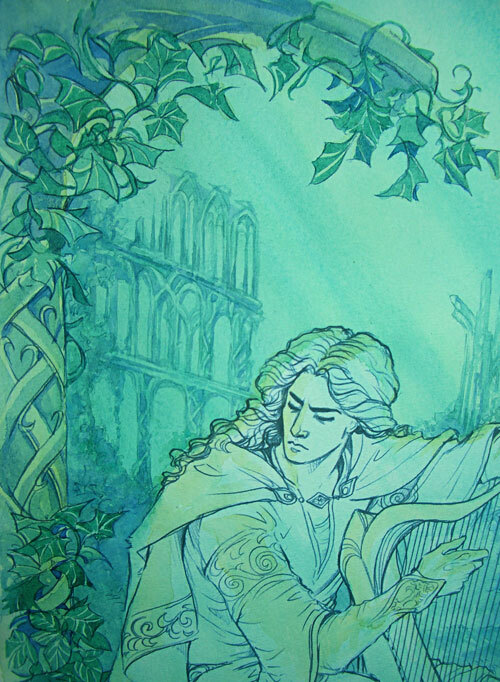 My last post is in the middle earth theme, in my french comments with beautiful gregorian voices. Songs are/cover from, My immortal, “Wish you were here”, “Sound of silence”, “Comfortably numb”. Beautiful songs. Of course no answers what so ever, I think I scared them with my coincidences fallen angels/ stars/ maya/ Tolkien fun stories without the seriousness. I feel like my home town is behind me now :p Seriously it was taking too much from my personal projects. This is a beautiful picture! Well done! Awesome, I look forward to seeing the finished version! There’s something wrong with his left arm, the upper arm is too short. Or possibly the right one’s too long. They’re different lengths, anyway! The left elbow is bent away from the viewer, but the angle of the hand doesn’t fit with that bend, so thanks to the clothing it looks like the arm is straight out. I remember trying to make the arm longer and the leg shorter, and both looked weird in the lineart. Now I sit here trying to hide those things. ;) Some things only become apparent when you render…. Mood captured prefectly, I love it. 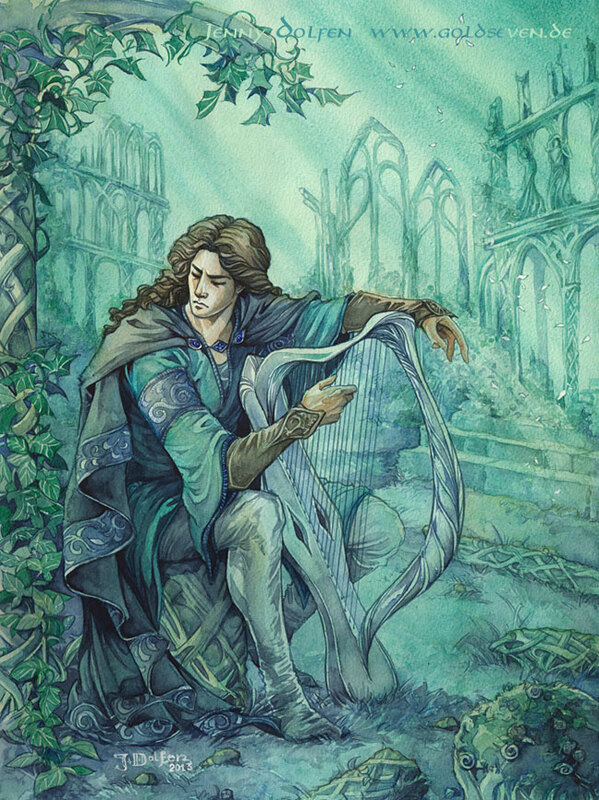 Perhaps also Maglor himself should be fading – caught in Middle-earth and doomed to fade along with even the memory of the proud Eldalië (if memory serves me, Tolkien never rejected the thought that the Elves that remained in Middle-earth would somehow fade and become strangely incorporeal). 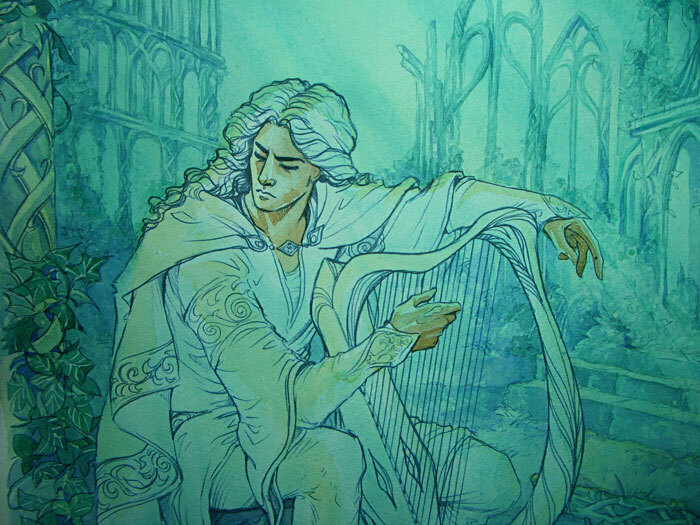 There is something almost Escherish to the harp – probably because of the twisting column & neck, but the plane of the strings seems to change depending on where I look. Is this deliberate? I noticed it when I started painting – these things often slip through until I render – but when I noticed it, I felt it wasn’t a catastrophe due to the surreal and dreamlike nature of the image. This is absolutely beautiful! Just a quick question: What type of paper do you use for these projects? You’ve probably mentioned this before, but I can’t seem to find it. 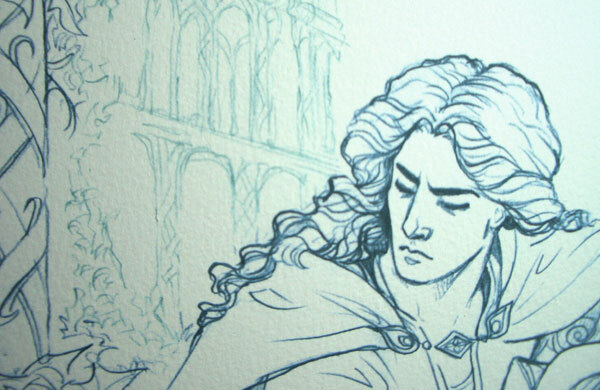 Most often, I use cold-pressed Canson Montval paper these days. Eine wunderschöne, detaillierte Arbeit mit viel Atmosphäre *_* Du inspirierst mich wirklich.